Do you suspect a leak in your home or place of business but are unsure of the source? Give the leak detection experts at Anytime Restoration a call to identify any leaks and their cause before the problem worsens. Anytime Restoration has been providing leak detection services for homes and businesses throughout the area for over 28 years. Call Anytime Restoration for leak detection and avoid having a water damage emergency. Even a pipe that is dripping slowly or intermittently can make a huge mess. When moisture sits behind walls and under flooring, mold and mildew will grow. Sitting moisture also rots wood and compromises the structural supports of a building. If you suspect that you've got a leak, call the experts at Anytime Restoration ASAP. Signs of a leak can include hearing water dripping or running, seeing cracks or stains in ceilings and walls, feeling moisture under carpeting or smelling musty odors. Our skilled team will assess the situation, identify any leaks and quickly resolve the problem. Once identified, our dry out team will quickly and thoroughly remove damaged boards and insulation materials and dry all structures. Anytime Restoration will stop leaks and prevent larger water damage problems. Simply call (612) 254-9542 for a free quote. When you call Anytime Restoration to look into your leaking pipes, appliances and more, a water damage professional will be deployed to your home or office, armed with state of the art equipment and the knowledge to use it to get to the bottom of the issue quickly and accurately. Once identified using one or more of the methods below, we'll work to devise a plan to resolve the leak and dry the area completely. Ultrasonic Leak Detection - We can hear leaks as well using sound technology. This can help locate the source of a leak and is used when we can't get a visual. 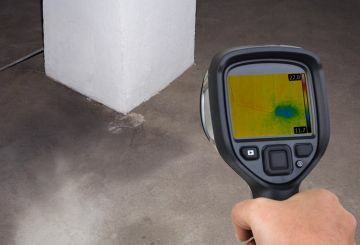 Infrared Leak Detection - We are able to use infrared imaging to see behind walls and under floorboards. The devices pick up moisture and allow us to target the source and scope of the leak. Smoke Detection - Less commonly, non-toxic smoke can be pumped into pipes. If a leak is present, the smoke will escape at the source, allowing the technicians to identify and correct the leak.